Our mission is to make better climbers of every customer who joins one of our programs from beginners to the experienced, and every one of our guides considers teaching to be a primary part of their job. We want to share our love of the mountains and for you to leave our programs better able to enjoy the outdoors. Whether your goal is to safely go rock climbing with your friends, ski in the backcountry, to climb Mt. 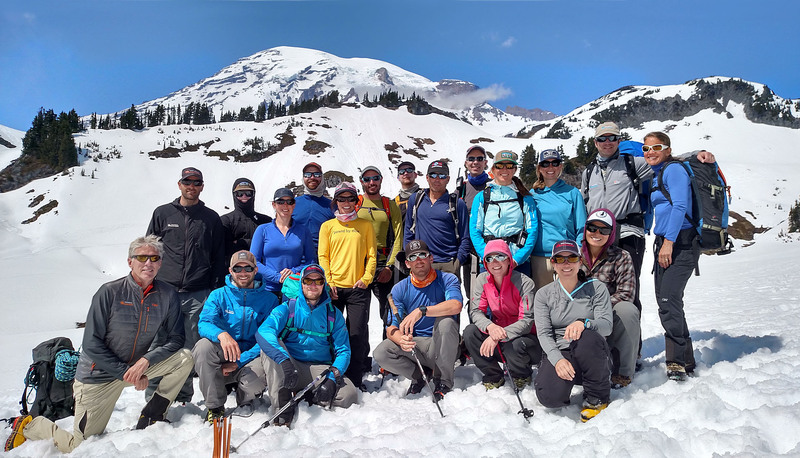 Rainier or the Seven Summits, we have the experience, skill, and passion to help you make that happen. If you are just starting out, and want to see what courses, seminars and climbs we have available for new climbers, take a look at our Expeditions Filter, and check the boxes for "beginner" and "skills building." You can also filter by dates and locations. International Mountain Guides directors Phil Ershler, George Dunn, Eric Simonson, and Paul Baugher, along with their world-class guide staff, organize and lead climbing, trekking and mountaineering expeditions around the world, from the classic climbs of the Alps and Andes to the 8,000m peaks of the Himalayas. We continue to be one of the most respected and active guiding companies in the world. Since 1986 we have conducted hundreds of expeditions to destinations around the globe, and the fact that most of our customers climb with us again and again tells us we're doing things right! I knew next to nothing about ice climbing... Both guides were very thorough in their instruction and provided lots of time to practice until everyone in the group felt comfortable. Additionally, the guides' patience and encouragement enabled everyone to climb up amazingly steep ice terrain. Their knowledge and passion for ice climbing came through and got everyone more excited to learn and climb. I find that IMG guides treat each client with a personal focus. Both Justin and Sondra are technically astute, but more-so, both guides are personable, funny and cater to each client's needs offering the right amount of support and encouragement... I got so much more than just instruction in technical ice climbing. I learned about knots, belay devices, rappelling (the first step over the edge is scary as heck, but the guides walk you through the entire process), and multi pitch climbing. The entire trip was incredibly fun and I cannot believe how much I learned in such a short time period... This 3 day trip left me with such a sense of accomplishment and reward... not to mention, some really cool looking pictures of me ice climbing! Every one of the guides, Josh, Johnny, Ian and Cedric were AMAZING!!!!!!!! They each took the time to share their knowledge, tips/tricks, share stories and made me feel like I belonged on Mt. Rainier with them. I can't thank them enough for that! This seminar for me was to decide if higher mountains or mountaineering in general is in my near future. After climbing beside Josh, Johnny, Ian and Cedric, the answer is YES! And I will only climb with IMG! I can't say enough great things about IMG and the four guides... Thanks again for a great Mt. Rainier climb, and I look forward to my next adventure with IMG! Let me just say that I found your entire operation to be first-class... Beyond our personal group experience, we had the rare opportunity to observe our guides dealing with the unforeseen situations of lost and missing independent climbers in poor weather conditions. Their communications and coordination with base camp, the Park Service, and other guide services on the mountain were reassuring, and I must again say highly professional. It is clear that IMG looks far beyond technical climbing skills and experience when hiring guides  you obviously seek a certain type of high quality individual to lead your clients. In my personal experience I can honestly say, 'Well done.' I may never climb the highest mountains of the world, but after my experiences on Rainier I certainly am inspired to continue to explore not only the outdoors but my own personal limits. You may rest assured that I will call on you again should I seek a guided climb anywhere in the world, and I will certainly sing the praises of IMG to any friends and acquaintances seeking adventure... Thank you for an extremely fulfilling experience.